UConn’s Spring Valley Student Farm is now home to a newly up-and-running aquaponics facility, a welcome addition to the farm, which already grows and provides fresh produce to campus. The year-round means of growing vegetables is a source of pride for graduating senior Kelly Pfeiffer ’18 (CLAS), a psychological sciences major who has helped shape an idea into reality. Starting out as a hope, then transitioning into a grant proposal, the aquaculture plan for Spring Valley Student Farm is now finally coming to fruition, through the tenacity of the students who work at the farm. Former undergraduates Carl Underwood ’16 (CAHNR, CLAS) and Gabriel DeRosa ’17 (CAHNR) originally hatched the concept and were awarded an IDEA Grant to get it started. When they graduated, Pfeiffer took on the project and has carried it to completion as the current aquaponics plant care specialist. 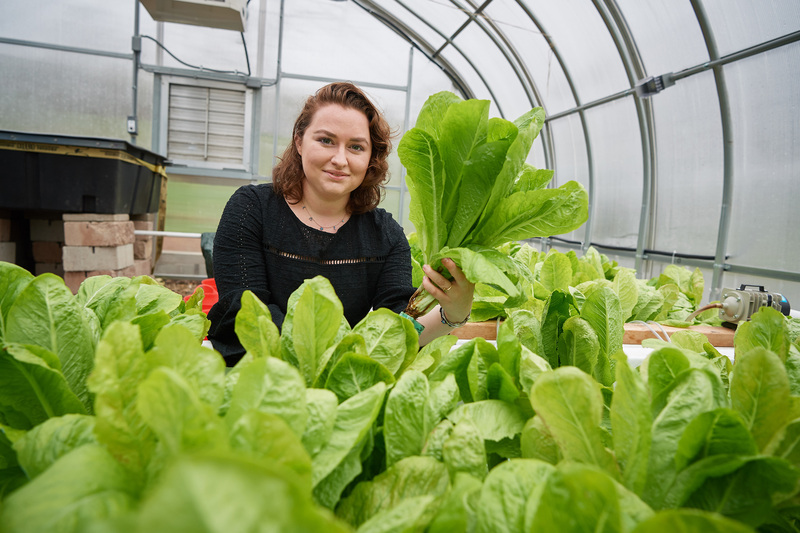 “My goal was to have the aquaponics system up and running with fish by the time I graduated, and this is now happening, all in time for the summer growing season,” says Pfeiffer, one of 11 students who live on the farm. Hydroponics is the cultivation of plants in water, however aquaponics combines the rearing of aquatic animals in a hydroponic environment. Nitrogen is a nutrient plants rely on for growth and nitrogenous wastes are a fact of life for any organisms, such as fish, that metabolize proteins. The resulting waste is excreted as nitrogen-based compounds, such as ammonia or urea. In an aquaculture system, there must be a way to manage and remove excess nutrients from the aquatic environment, otherwise the water becomes toxic to the fish. These wastes, highly rich in nitrogen, are broken down by a community of bacteria, into forms of nitrogen that are easily used by plants. No longer simply a nuisance, the fish waste is now fertilizer. Pfeiffer explains that aquaponics systems and traditional agriculture are similar, in that they both rely on monitoring of macro and micro nutrients to effectively grow healthy plants. So why grow in an aquaponics system? “There’s a surprising statistic for this technology, that you can grow four heads of lettuce in an aquaponics setting for every one grown through traditional soil growing methods,” says Pfeiffer. In other words, grow more in less space, using the closed loop and symbioses between plants, animals, and bacteria. Koi fish will soon be added to the 450-gallon tank of the aquaponics set-up to supply the nitrogenous wastes, creating a symbiosis or closed loop between the animals, bacteria, and the plants, all reliant on one another. Pfeiffer says striking the right balance can make aquaculture tricky, and will depend on trial and error as well as close, continuous monitoring of nutrient levels in the water. The system flows from the fish tank, where water and solid fish waste are siphoned off into a filter, and then a large tray filled with porous shale that further filters the water and also creates a medium where the bacteria live. The expanded shale bed is a two-way filter, filtering as the water levels rise and fall, as well as where the bacteria colonize. It is also an area of the system where plants can be grown. Although not intentionally planted, a lone squash plant has volunteered and is demonstrating how fertile the planting area is. Basil has since been planted in the bed, along with the squash plant. From the shale bed, the filtered water then drains into deep-water culture beds, each around 12 inches deep. The beds are currently home to the system’s first crop – romaine lettuce. Through circles cut into blue sheets of Styrofoam insulation board, the lush lettuce plants emerge, their roots reaching into nutrient-rich water below. Planting out a crop is a matter of starting the seeds in soil and then transplanting into floating plugs. Since lettuces take only a couple of months to go from seed to harvest, the system will be capable of providing a fair amount of produce throughout the year, Pfeiffer says. The produce will be supplied to Dining Services. Besides growing food, the system is also sprouting research projects. Julia Cartabiano, manager of the Spring Valley Student Farm, says there are several collaborations stemming from the aquaponics system in various disciplines across campus, including two professors in the School of Business who plan to use the greenhouses on the farm as a learning lab, and a computer science student in the School of Engineering who hopes to work with the farm as his senior design project. Undergraduate researcher Tanzin Begam ’19 (CLAS), a third-year biology student with a minor in bioinformatics, recently presented a poster on her work studying the microbial community of the aquaponics system. As in any ecosystem, the right mix of bacterial species is vital for the health and success of an aquaponics system. More specifically, Begam says she was looking at the succession of the bacterial community within the system after set-up and before plants or fish were introduced. Her advisor, facility scientist Kendra Maas, says they weren’t able to find published research looking into how microbial communities are established within an aquaponics system, so this research may be a first. They hope to continue their analysis when the Koi are introduced. Maas hopes to one day make these tests an open service to the expanding aquaponics agricultural community across the state. “As aquaponics becomes more and more common in Connecticut, this could be a useful service for growers,” she says. The Spring Valley Farm aquaponics system is another great example of how UConn’s agricultural roots are helping to grow research innovations in unexpected ways. After graduation, Kelly Pfeiffer will start work as a marine science instructor at the Catalina Island Marine Institute in California. Tanzin Begam hopes to graduate in May 2019, and will continue her study of the aquaponics system’s bacterial community in the meantime.